In the current "pruning" season for my family and me, my thoughts keep returning to this post. 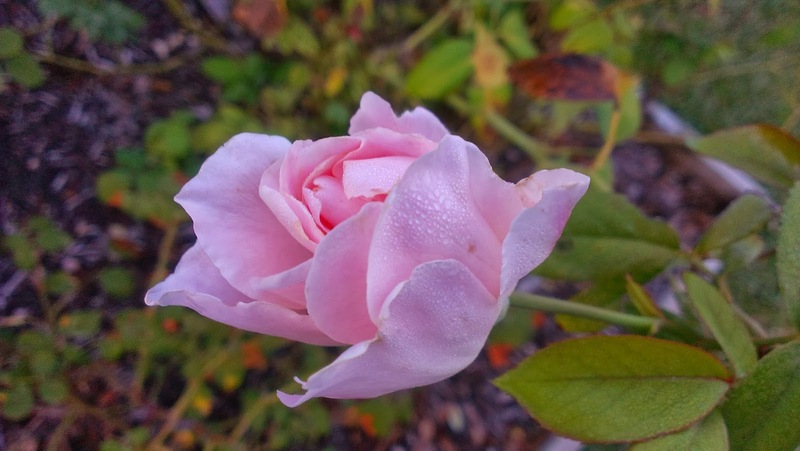 It was composed in spring at the end of the first blooming of our roses; in the current fall season, the severely pruned roses have begun to bloom again after months of shaggy branches and bare rose hips. The blooms remind me of God's hope. He does not discipline His children to cast them away, beloved. "For the moment all discipline seems painful rather than pleasant, but later it yields the peaceful fruit of righteousness to those who have been trained by it" (Hebrews 12:11, ESV). If you are in a season of discipline and pruning, dear Crumble, may the Lord strengthen you to "lift your drooping hands and strengthen your weak knees" to press on, eyes fixed on Jesus, in the race of life (Heb. 12:2, 12). 1. (of certain roses) blooming more than once in a season. Sere calyxes bereft of glory. The catalog assures, "R - repeat bloomer,"
The wound but paves the way for glory. "I am the true vine, and My Father is the vineyard keeper. Every branch in Me that does not produce fruit He removes, and He prunes every branch that produces fruit so that it will produce more fruit. My Father is glorified by this: that you produce much fruit and prove to be My disciples" (John 15:1-2,8, HCSB). Another Month, Another Multitude. . .